It is likely that a good part of the crowd surging toward Jordan Hall late in the evening on Friday night to hear an 11 o’clock BEMF performance by Musica Pacifica had a good idea of what to expect. I did not. This San Francisco-based ensemble consisted of seven superb players who presented a delightful program largely made up of dance tunes from the British Isles: Ireland, Scotland, and England. Any performance of some two dozen tunes simply played one after another runs the risk of monotony. But as organized by the designers of the Musica Pacifica program, grouped into what might be called suites, offering charm and variety, the result gave particular pleasure, not only to those like me whose family heritage is mostly drawn from the British Isles, but also, on the evidence of audience response, to the general audience. Tunefulness was the order of the day, and the performances were little short of sensational. 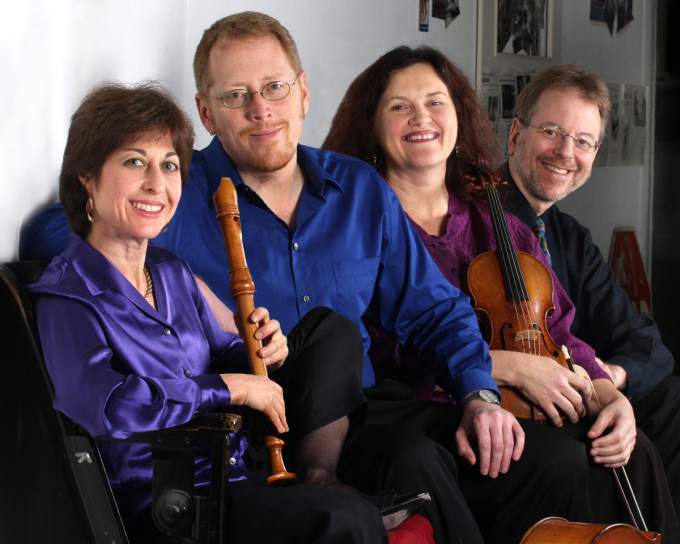 The ensemble consisted of recorder (Judith Linsenberg), two violins (Elizabeth Blumenstock and Robert Mealy), viola da gamba and cello (David Morris), lute and guitar (Charles Weaver), harpsichord (Charles Sherman), and percussion (Danny Mallon). Not all of them are based on the West Coast, but when they get together as Musica Pacifica, some magic happens. In addition to offering a selection of tunes arranged into suites, the program included two classic masterpieces, one by Purcell and a movement from a Veracini violin sonata. The link between these pieces and the rest of the program was their use of dancelike melodies similar to the dance tunes that filled the rest of the program. There were surprises here, too. The opening set, composed by 18th-century composer James Oswald, was called “Sonata of Scots Tunes.” By this the composer did not mean anything remotely resembling the sonata allegro form of classical symphonies. The reference was clearly to the traditional trio sonata of the Baroque era, consisting of several movements generally alternating a slow-fast-slow-fast pattern. This particular sonata called for five movements, each a well-known tune. The first two were in slow tempos, Largo and Adagio, comprising together an opening slow section. They were followed in turn by an Andante, a Largo and an Andante, which could be understood as making up the remaining three movements of a Baroque sonata. The result was quite charming, particularly the evidently somewhat risqué song “She rose and let me in,” and the finale, “Polwart on the Green.” Both of these built up quite a head of steam, and set toes tapping At least these toes. Interspersed between the first two these suites was Henry Purcell’s Three Parts Upon the Ground, a showcase for the composer’s imagination and contrapuntal genius. Three melody instruments—here two violins and recorder—perform over a repeating ground, and obsessive melodic fragment that is heard 28 times. The basic mood is that of a chaconne, a French dance form, over which the three melody instruments superimpose an ever-changing series of contrapuntal tricks in widely varied expression. In a sense, the repeated bass line in its dance pattern suggested a French origin, while the melodic lines intertwined above it are very Italianate. Between the last two suites of dances, Elizabeth Blumenstock and the continuo players performed a single movement from a violin sonata by Francesco Maria Veracini (Op. 2, No. 9), who spent many years in England. This little-known piece offered perhaps the single biggest surprise of the entire program. The movement performed here was described as a scozzese, or Scottish piece; it was in fact a set of variations on a Scottish border ballad called Tweed Side. The effect was that of hearing a very Italian sounding piece of music that suddenly jumped geographical boundaries, from Veracini’s home town of Florence to the Scottish border, with lively indications of dance tune and the “Scotch snap” invading the rhythm. The soloist performed this to a fare-thee-well, bringing down the house with loud cheers. A concert starting at 11 PM may seem utterly disobliging to its intended audience, but Musica Pacifica’s lively program and superb performances, running just 70 minutes without intermission, kept all on our toes and energized past midnight. CONGRATULATION TO YOU ALL FOR GREAT CONCERT!